While developing the IDA Bochs plugin at Hex-Rays, we had to write a small MBR and we needed a nice and fast way to compile and debug our code. 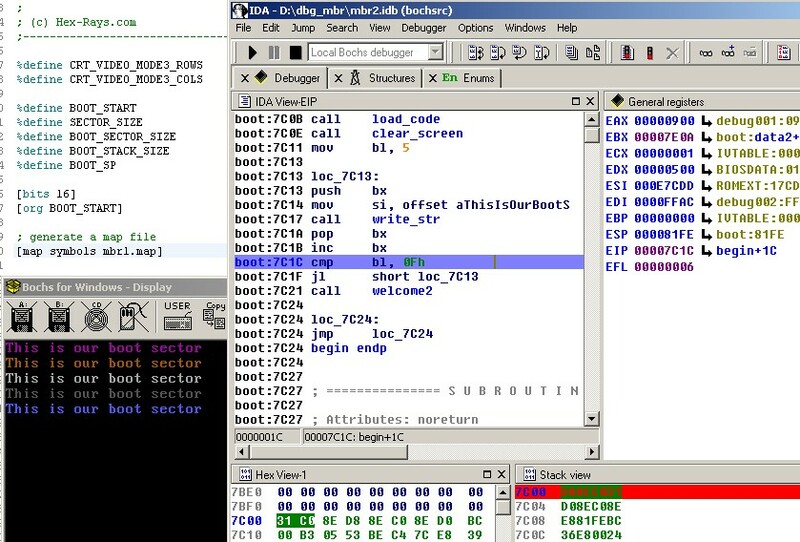 In the beginning, we were using bochsdbg.exe to debug our code and little by little once we coded the “Bochs Disk Image loader” part we could debug the MBR with IDA and Bochs plugin. Now you may be wondering: How can I use IDA Bochs plugin to debug my MBR? In case you did not know, bochsrc files (though they are text files) are handled by the bochsrc.ldw (IDA Loader). The loader parses the bochsrc file looking for the first “ata” keyword then it locates its “path” attribute. In the following example, bochsrc loader will detect “c.img”. After finding the disk image file, the loader will simply create a new segment at 0x7C00 containing the first sector of that file only and then it selects the Bochs debugger (in Disk Image loader mode). Once the loader is finished you can press F9 and start debugging. What if we want to customize and control the MBR loading process? Fortunately, IDA Pro provides a rich API (with the SDK or scripting) that will allow us to tackle all these issues. 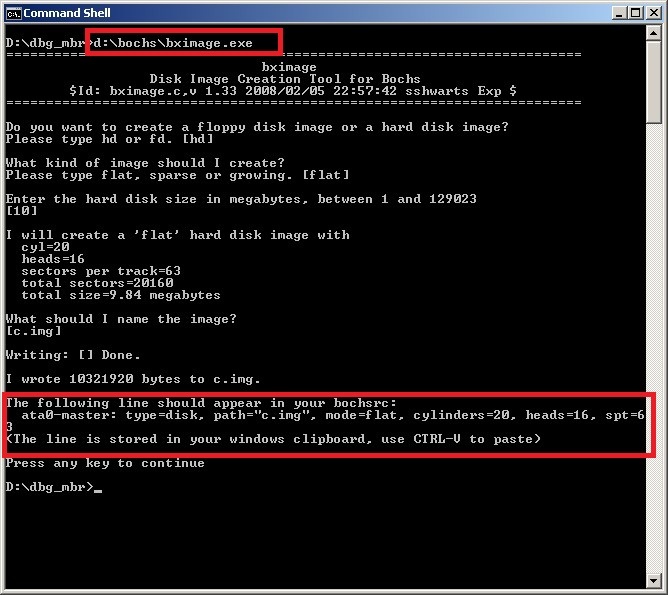 If you don’t have a Bochs image ready, please use the bximage.exe tool to create a disk image. Edit your bochsrc file and add the ata0 (generated by bximage tool) line to it, and finally run bochsdbg.exe to verify that you can run Bochs properly (outside of IDA). If you see the Bochs debugger prompt, you can press “c” to continue execution but Bochs will complain because our disk image is not bootable. For your convenience, we included a sample mbr.asm file ready for you to compile. What we did is simply extend the segment from 512 to 1024 (our sample MBR is 1024 bytes long) and load into IDA the rest of the MBR code from the compiled mbr.asm binary. map_file = MBRNAME + ".map"
If you noticed, we run IDA twice: the first time we run it and pass our script name to IDAPython; the script will continue the custom loading process and symbol propagation for us. The second time we run IDA with the “-rbochs” switch telling IDA to open the database and directly run the debugger. You can still run IDA just once: “start idag -c -A -OIDAPython:mbr.py bochsrc” however you do not call Exit() and you turn off batch mode (with Batch()). And last but not least, how do you debug your MBR code? Please download the files from here. Comments and suggestions are welcome. Thanks MazeGen for bringing this to our attention (using Chrome this problem did not manifest itself).